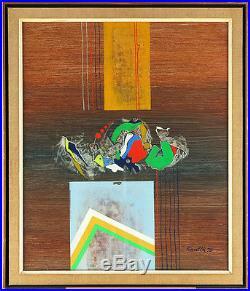 1935 Slovakian/Canadian Listed Mixed Media Abstract. 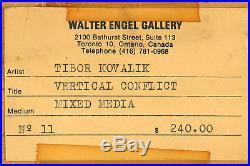 Up for sale is vintage 1972 original mixed media painting by Slovakian/Canadian artist Tibor Kovalik (born 1935). 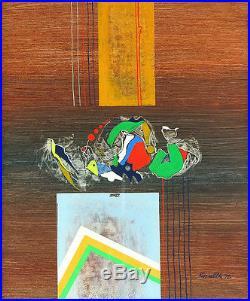 This abstract is titled Vertical Conflict and it is very well executed with high level of artistic skills. 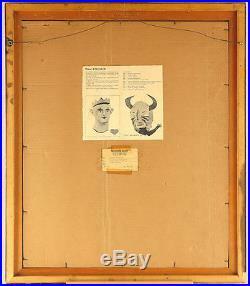 The painting itself is measuring about 24 (61 cm) by 20 (51 cm), and the frame is measuring 27 (68 cm) by 23 (58 cm). It is signed and dated by the artist in the lower right corner. At the back it also has artists biography and label from Walter Engel Gallery with artists name, medium used and title of the painting. This painting would be a very sound investment and a great addition to any collection. Please note that most of the items we sell are vintage or antique, and therefore they have some imperfections due to age, wear, etc. Anything I consider significant I would mention in the description. Also please note that we deal in fine art, we are not a framing business. We examine carefully the paintings and report any issues detected, but the frames we get them in come along just as complementary, in as found or as is condition. We take great care in packing the items to make sure they arrive safely, and all of our items are fully insured. Canadian residents please add 5% GST or 12-15% HST where applicable. 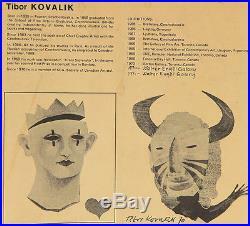 The item "Tibor Kovalik (b. 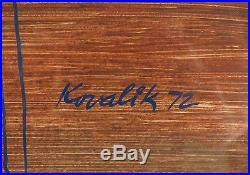 1935) Slovakian/Canadian Listed Original Mixed Media Abstract" is in sale since Tuesday, June 6, 2017. This item is in the category "Art\Paintings". The seller is "artmarketspot" and is located in ON. This item can be shipped worldwide.